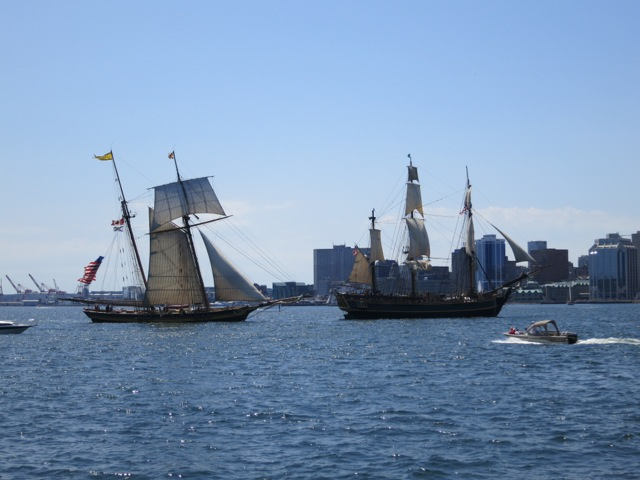 The main reason I extended my camping retreat to Halifax was so that I would not miss the Tall Ship Festival. I’ve always been a fan of the big sailing ships, and last summer in Halifax we enjoyed inspecting the various ships on the Halifax harbourfront. I spend three days at the festival – the opening day (Thursday), several hours on Saturday, and finally I returned Monday to watch the sailpast. It was the latter that was the more enjoyable for me. I sat on the Dartmouth shore, watching the ships sail towards us, and then tack to sail in front of the Halifax harbourfont. It is quick spectacular to watch a tall ship tack – and not all of them were that successful in the endevour. Here are some of the best pictures from the festival. 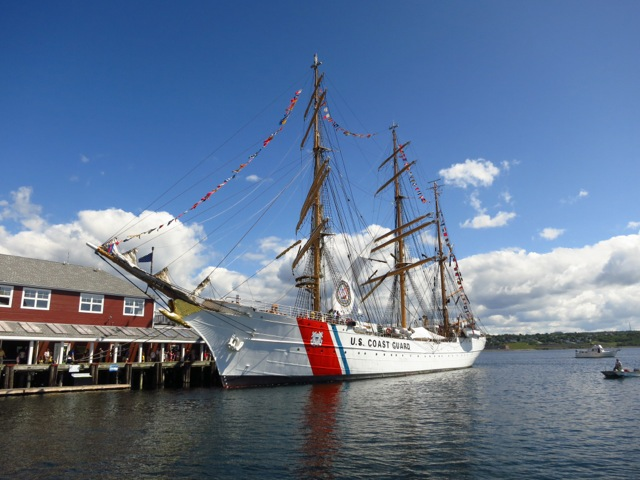 The United States Coast Guard Ship the Eagle. It was the only ship that was offering free tours, that is, you didn’t need to purchase a wristband to go on the tour. It was by far the largest ship there. When asked, the officer on the gangway said that it has approximately 65 permanent crew and requires about 150 to sail under full sail. It is primarily used as a training vessel. 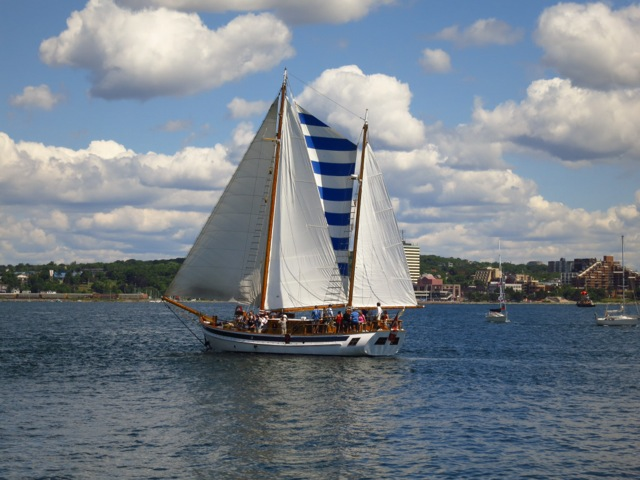 The Mar is the only tallship in Halifax Harbour that does regular sailing tours. There is another ship in the Harbour that sells “sailing” tours, but it only puts up the sails for show. It doesn’t turn off the engines, and often is seen “sailing” directly into the wind with sails luffing! On Thursday, I arrived while many of the ships were still in quarantine for customs, such that they were not yet open for tours. 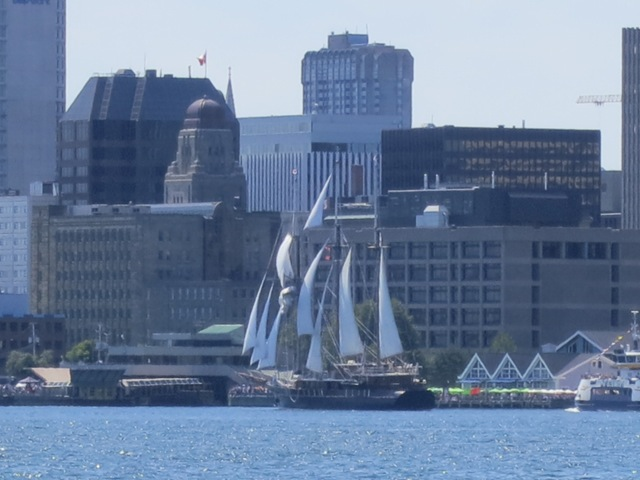 To kill some time, I took the tour on the Mar, which was an enjoyable 90 minutes of actually sailing around Halifax Harbour (including at least 4 tacks). One of the few ships that did the sail past under full sail. It was quite spectacular to see. The HMS Bounty sure did the best from a “show” perspective, with her square rigged sails. The ship is a remake of the original HMS Bounty (from the book Mutiny on the Bounty). It was used as the British Navy ship in the Pirates of the Carabean. It also starred in Sponge Bob Square Pants. During the festival, the crew from the HMS Bounty were dressed up as pirates – some where where rather elebroate and warm costumes. Given how warm it was in Halifax, it could not have been that pleasant. 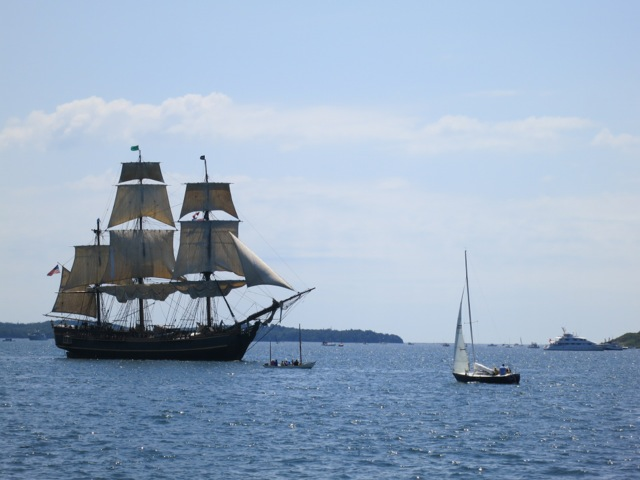 Here is the HMS Bounty (front) about to tack, with another ship which has very raked (tilted backwards) masts.